As I continue my journey of discovery of Indians in Arizona, I am finding out that the names are all pretty much the same - they are the people. “Us and them” pretty much describes the relationship between tribes, whether at peace, or at war. But that is not to say that the names of the tribes lack meaning, or are in any way trivial. Its just, well, that you really can't call every tribe “The People” anymore than you can call every city “The City”. The names we know of tribes are given by outsiders. The name of my tribe (and I know it sounds like I am kidding here) was given to them by the Romans. They were the Britons. Yes, that's where the name of Britain comes from. I will never have any way of knowing what my tribe called itself, but it was most mostly probably the people. And the Romans were simply the enemy. When you use the names of Indian Tribes in Arizona, or the names of any tribe in the world, you will probably be using the name that was given to them by an outsider, maybe a friend, maybe not. If you know your Arizona history, you know that from the 1500s to the 1800s a lot of Spanish was spoken. Yes, the area that now includes the State of Arizona was part of New Spain, and then New Mexico. And even nowadays a lot of Spanish is heard. So some the tribal names are misunderstood words that have been translated in Spanish. In my lifetime I am seeing a breaking away of the names given to tribes by outsiders. The names are being replaced by the names that may seem like tongue-twisters, as they show respect for the language of the tribe. If you've not comfortable pronouncing them, it's not surprising. The sounds aren't English, or even Spanish. They are the sounds of the people. Pima - Akimel O'odham. In their language, it means The River People. And the river, by the way, is the Gila. Papago - Tohono O'odham. These are the Desert People. Maricopa - Piipaash. The People. For purposes of continuing my historical research, I will call these tribes by they names given to them by outsiders. I am an outsider myself. But I will know that they are the people. 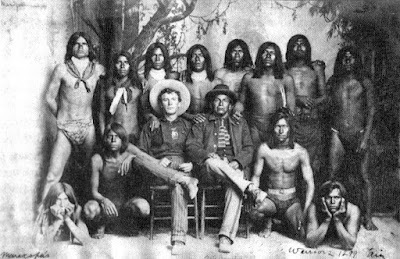 Image above: 1889 photo of Maricopa and Pima Warriors, and a cowboy. Navajo - Diné it unsurprisingly it means The People or Children of the Holy People. Be careful about using the outsider's name. I'm not sure about other tribes but some Diné don't like "Navajo"